Thoroughly mix the turkey, stuffing, cheese and egg in a large bowl. Shape the mixture into 42 (3/4-inch) meatballs. Spray a 12-inch skillet with vegetable cooking spray and heat over medium-high heat for 1 minute. 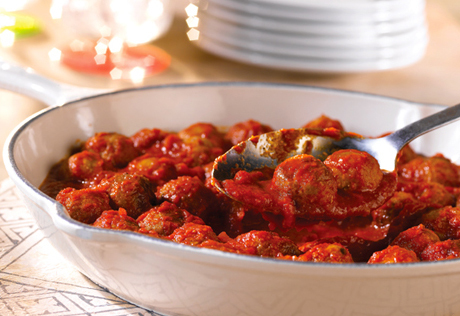 Add the meatballs and cook in 2 batches or until they're well browned on all sides. Remove the meatballs from the skillet and set aside. Stir the sauce in the skillet and heat to a boil. Return the meatballs to the skillet and reduce the heat to low. Cover and cook for 5 minutes or until the meatballs are cooked through. Recipe Note: This recipe can be an appetizer or served as a main dish with pasta.